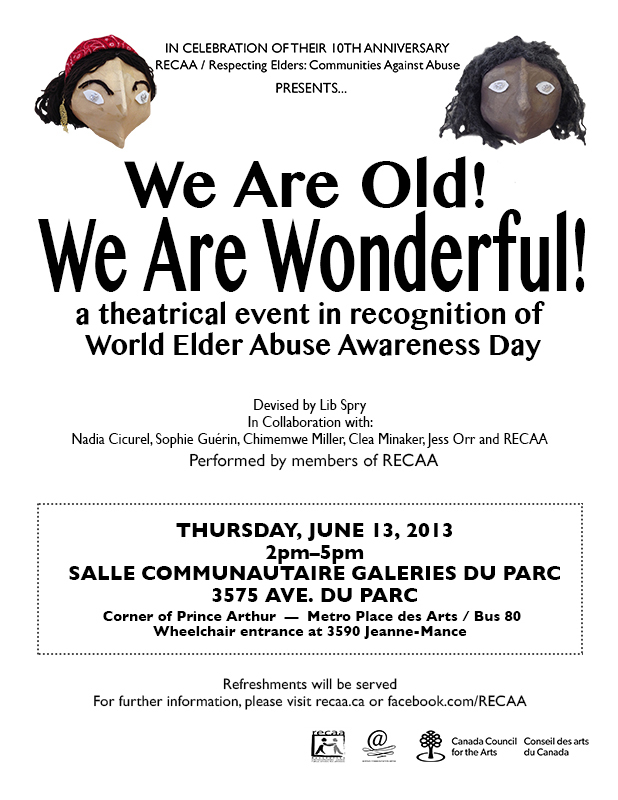 It is our 10th anniversary this year and to kick off the celebrations, RECAA is happy to present We Are Old! We Are Wonderful! 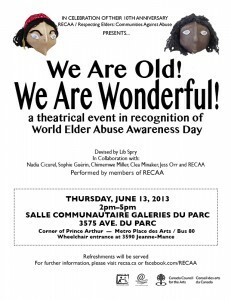 Come and see RECAA celebrate the positives, and some negatives, of growing old to mark World Elder Abuse Awareness Day 2013. We will sing, dance, set puppets performing, show the videos we have made as we laugh together, speaking up for the old. RECAA members have worked with director and playwright Lib Spry, performer and community theatre worker Nadia Cicurel, musician and composer Chimwemwe Dave Millar, puppet and set creators Clea Minaker and Jesse Orr and documentary film-maker Sophie Guérin learning new skills, and developing old ones. This is the culmination of several months work as part of an Artists and Community Collaboration grant funded by the Canada Council of the Arts.